Profit Future is the best way to access the global financial markets of the future. We are a group of dedicated developers, traders and analysts who believe in the upcoming paradigm shift that crypto-currency and the Blockchain are bringing dividend to the global financial industry. In our work, we use only advanced technologies and advanced algorithms for trading process and marketing promotion of the company. Altcoins or alternative digital currencies, are one of the most exciting markets for traders today. They are highly volatile, fast paced markets, in which a lot of money can be made in a short space of time. Our team trade with Bitcoin, Litecoin, Ethereum, Dash, Monero, Clubcoin, Zcash, Ripple and many more. For Example we use Poloniex, BitStamp, BTCe, Bittrex and many other trading platforms for trading this crypto currencies. To ensure secure and comfortable access to the worldwide financial markets for our customers, our servers are physically located in the heart of the financial industry in the United Kingdom. Profit Future is based in the United Kingdom and founded by Andrea Medri (CFO) and Davide Barbieri (CTO), two entrepreneurs well known in the english Bitcoin community. The development of the exchange never stopped, and we signed some important partnerships in order to improve the features offered to our clients. We offer the best conditions in the international market of investment and trust management. The technical group and the team of financial experts are making every effort to ensure safety of your assets and rapid multiplication of your capital. The amount of 50 USD has been withdrawn from your account. Accounts: U39*****->U17542399. Memo: Shopping Cart Payment. . Date: 14:02 13.01.19. Batch: 242596725. Fairmonitor.com - ON the AMOUNT of YOUR REFERRAL EARNED 10% per MONTH / Rich-and-Free - All deposits our partners are insured ! The amount of 10 USD has been withdrawn from your account. Accounts: U*****->U17542399. Memo: Shopping Cart Payment. . Date: 15:42 13.01.19. Batch: 242606064. The amount of 60 USD has been withdrawn from your account. Accounts: U1651590->U17542399. Memo: Shopping Cart Payment. . Date: 16:01 13.01.19. Batch: 242607977. 13.01.19 11:53 Transfer Sent Payment: 35.00 USD to account U17542399 from U5505***. Batch: 242586095. Memo: Shopping Cart Payment. the payment of ref. com. 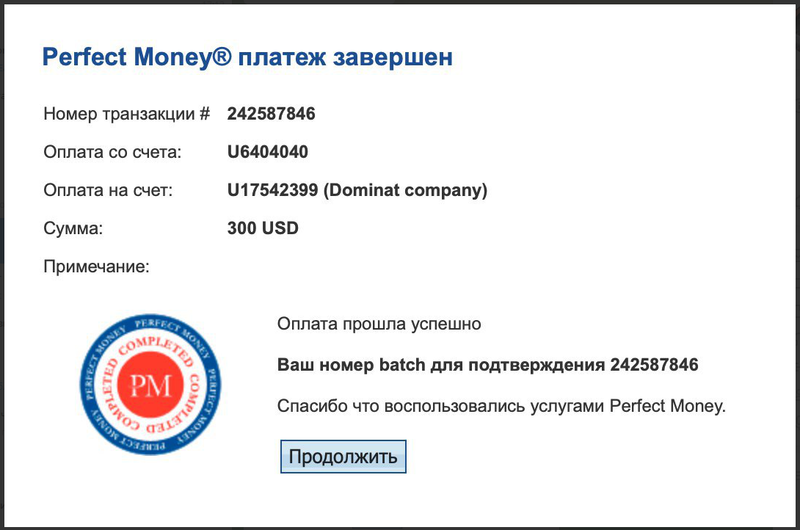 13.01.19 18:56 Receive Received Payment 10.5 USD from account U17619459 to account U5505***. Batch: 242623843. Memo: API Payment. user_id77a10.50000000. 01.13.19 11:16	Account	Transfer	-50.00	Sent Payment: 50.00 USD to account U17542399 from U18691***. Batch: 242582935. Memo: Shopping Cart Payment. 01.13.19 12:27	Account	Receive	+2.45	Received Payment 2.45 USD from account U17619459 to account U18691***. Batch: 242588610. Memo: API Payment. user_id41a2.45000000. 01.13.19 19:25	Account	Receive	+3.00	Received Payment 3.00 USD from account U17619459 to account U18691***. Batch: 242626351. Memo: API Payment. user_id41a3.00000000. My monitoring: www.hyip.center - refbek up to 5000%!